This December, Demon Records will issue Rejuvenation 2001-2014 a collectors’ coloured vinyl box set that brings together the studio albums of Simple Minds spanning the era that delivered covers album Neon Lights (2001) through to 2014’s Big Music. The albums in this set are Neon Lights (2001), Cry (2002), Black and White 050505 (2005), Graffiti Soul (2009) and Big Music (2014). The first three in that list make their first appearances on vinyl in this box, with specially-created outer and inner sleeves, and include some bonus tracks from the CD releases. 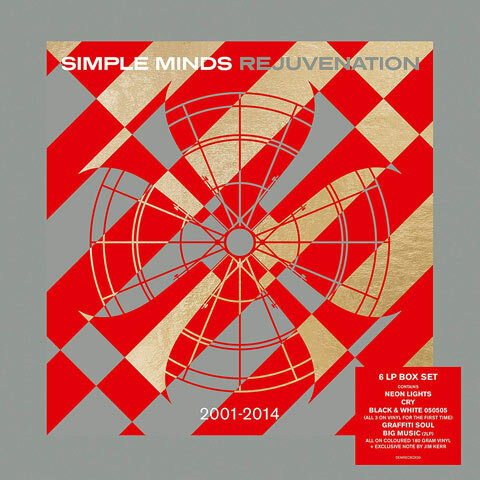 Simple Minds‘ Rejuvenation 2001-2014 box was originally issued on vinyl last year, but in March comes to CD as a large format 7CD+DVD package. This set contains the same five albums – Neon Lights (2001), Cry (2002), Black and White 050505(2005), Graffiti Soul (2009) and Big Music (2014) – but this time they all feature bonus tracks. Additionally you now get including the rare album of covers Searching For The Lost Boys (now including a cover of T. Rex’s ‘Children Of The Revolution’). Big Music actually gets its own bonus CD, which includes most of the tracks on the original two-CD deluxe along with some additional remixes of Big Music album tracks. ‘(Get A) Grip (On Yourself)’, with The Stranglers, also features on this disc. The DVD includes promo videos, interviews and behind the scenes footage and this comes with a 12 x 12″ book of photos with album-by-album notes written by Jim Kerr. 17. Where Is The Max? Hmm. 9 tracks I don't have due to them being DL tracks in other countries or the impossible nearly to buy CD single of "Stranger." The teamup with The Stranglers that was only a low-fi picture disc 7" from their webstore. One new song. If they had all of the insane number of "Cry" era DJ 12" mixes, I might have gone for it. They could probably do a 3xCD version of "Cry" with all of the stray mixes! I'll sit this one out and maybe buy those 9 as DL tracks, if that's possible. I only have the cash for one boxed set on March 29th and Heaven 17 is likely to go much further in meeting my needs. postpunkmonk wrote: Hmm. 9 tracks I don't have due to them being DL tracks in other countries or the impossible nearly to buy CD single of "Stranger." The teamup with The Stranglers that was only a low-fi picture disc 7" from their webstore. One new song. If they had all of the insane number of "Cry" era DJ 12" mixes, I might have gone for it. They could probably do a 3xCD version of "Cry" with all of the stray mixes! I'll sit this one out and maybe buy those 9 as DL tracks, if that's possible. I only have the cash for one boxed set on March 29th and Heaven 17 is likely to go much further in meeting my needs. i can't even begin to imagine the crazy licensing issues for all those other tracks and mixes. but i actually have most of them, as i bought them during the 'cheap' vinyl era. as a fan of both bands, it will definitely be included as vital, along with the heaven 17 one also. I've preordered it. They're my favorite band, and the DVD alone sells it for me (I don't collect vinyl).